The long put option strategy is a bearish options trading strategy that capitalizes on increases in volatility and downward moves in the underlying asset. In addition to speculation, purchasing put options are a common way to hedge existing long positions from drastic declines. Contrary to many long option trading strategies, the long put option strategy has a limited profit, which is capped at the underlying asset going to zero. 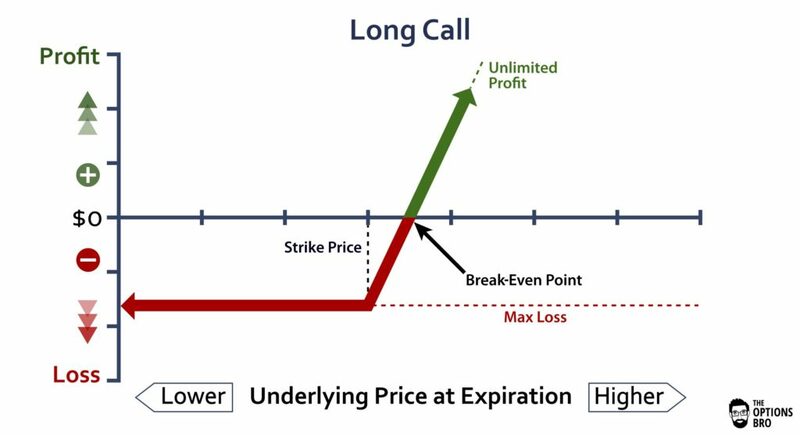 Long call options, however, have a theoretical unlimited profit. Read more about puts. Out of every online broker with 24/7 customer service in 2018, Ally Invest the has the lowest commissions to trade the long put option strategy as well as the best free options trading software. Read the Ally Invest Review. Note: like most options strategies, you can buy puts in-the-money (ITM), at-the-money (ATM), or out-of-the-money (OTM). Unlike buying calls, the potential profit for buying puts is not unlimited, since assets can’t trade below zero. 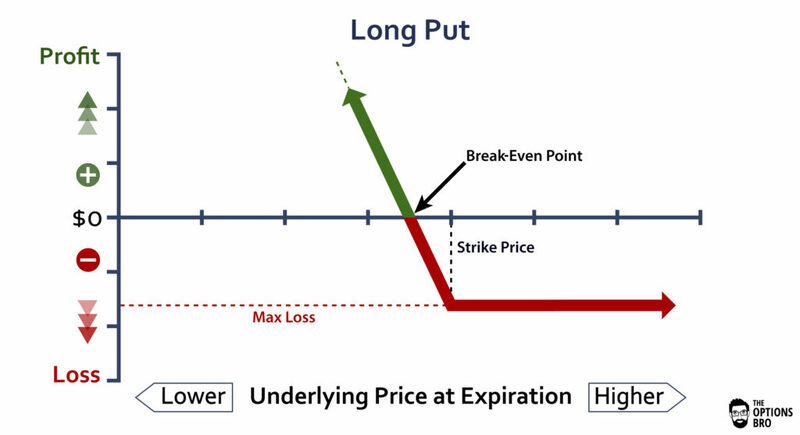 Breakeven point for the long put option strategy = strike price – premium spent. 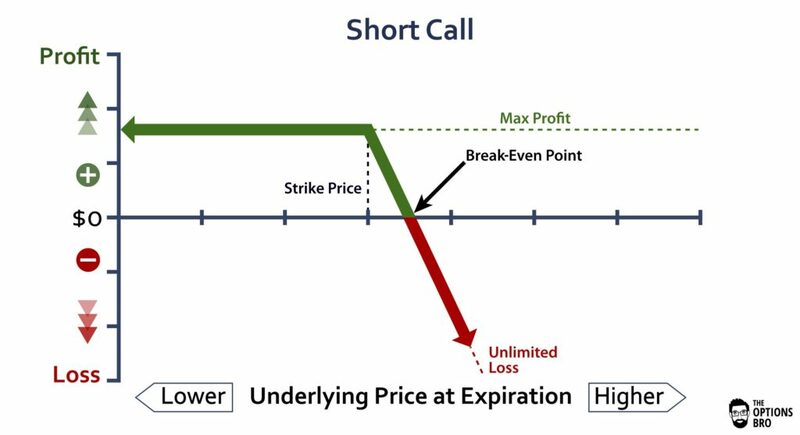 In the example above, the break-even point at expiration for buying 1 put in stock XYZ is $46.70 (strike price of option [$47] – premium spent [$0.30]). In other words, stock XYZ has to fall $3.30 in order to break even by the time the put expires. Why Trade Long Put Options? The main reason to buy puts in an underlying asset is out of fear or speculation that the underlying asset is going to decrease in value. A long put only pays if the underlying asset depreciates. Unlike many other options strategies that pay if nothing happens, oftentimes dramatic moves are required for the long put option strategy to be profitable. Besides buying puts to hedge long positions or entire portfolios, traders often buy puts to synthetically short a security without the possibility of an unlimited loss. When selling a stock or future short, i.e. selling to open, the max loss is theoretically unlimited. However, the max loss for a long put is always the total sum of the premium spent. This makes buying puts an attractive option for short-biased traders looking to limit their upside risk. Traders should be aware that puts generally trade more expensive than calls. For the majority of securities, there is always a possibility (however faint it may be) that the security could completely crash down. This is because there is an emotional element to a stock or futures contract or index that’s crashing and burning. Many traders just want to get out of a falling stock, but when this happens, the selling only increases. Buying puts should be thought of as buying insurance in case the underlying asset crashes. A lot of hedge funds and institutions can only maintain so much long exposure in the market, and instead of trimming their positions, they will often buy puts to protect their downside exposure; this also creates a demand for puts and it just makes them more expensive. The downside risk is simply larger for most people than the upside risk, because most market participants are long. The giant exception to this is with individual stocks, particularly biopharmaceutical stocks, where it’s common to see 300% increases overnight following a favorable FDA result. Before and after events like this, calls can totally trade richer than puts. The hidden risk with buying puts is overpaying for protection that will only pay if there is a severe drop in the underlying asset, like 20%. Stock crashes and financial crises are pretty rare, but they do happen. Nevertheless, put buyers need to be aware that far OTM puts can trade very rich with implied volatility, yet they have a high likelihood of ultimately expiring worthless. Why Not Just Sell Puts If They All Expire Worthless? Well, all puts do NOT expire worthless. Puts that are ATM frequently expire ITM. For far out-of-the-money puts, the likelihood of a worthless expiration is heightened. However, the massive caveat is that just because the puts will end up expiring worthless does not mean that they won’t increase in value before expiration. Even far OTM puts can double or triple in value with spikes in volatility, and this instills enough fear to cause many put writers to close out their positions; or be obligated to because of margin calls. The margin requirement to buy a put is always the total cost of the premium, i.e. the margin requirement for a long put is the maximum loss for the trade. Theta decay hurts a long put that is ATM or OTM. If you are long an OTM put, you will be fighting premium decay everyday. This is one of the major reasons why making money with puts that are OTM is so difficult. When should I close Out a Long Put? It depends on your objective. If you bought the put to hedge, then it would obviously be unwise to close the hedge prior to closing the original investment that necessitated a hedge. Ideally, the hedge and the original investment should be closed out at the same time to avoid slippage. A lot of traders who purchase puts out of speculation close out the put prior to expiration. As expiration nears, volatility and time premium will have less of an effect on an option’s price. As a general rule, long puts that have decreased to a near zero value should never be closed out. Essentially, it is a riskless trade. The value of the put can’t go below zero, so it can only go up in the event volatility increases or the underlying asset decreases. If a long put expires out-of-the-money, there is no need to take action. The position will automatically fall off of your account by the next trading day. If a long put expires in-the-money, there might be some cause for concern. If you do not have enough capital in your account to short the appropriate number of shares, a margin call will likely be issued. Usually, your broker will contact you prior to expiration asking you to close out a long put position that would have a negative margin impact on your account. The other expiration risk with owning puts, assuming the underlying asset is a stock, is that there will not be a lot of available stock to borrow. If this is the case, you could end up being short the stock and charged a hard-to-borrow fee. However, this is very rare and it is best to check with your broker prior to expiration about the impact of a long put. The long put option strategy is a great way to short an asset and eliminate the possibility of an unlimited loss. If you sell a stock or futures contract short, there is always the possibility of the worst-case scenario loss. The long put option trading strategy eliminates this possibility. In exchange for this favorable risk/reward ratio, long puts (especially those that are OTM) have a high probability of expiring totally worthless. If you short a stock or future, the short position itself can never be worthless. This is one of the key distinctions between buying puts and outright shorting an asset. Another key distinction, is that puts are subject to changes in volatility, where shorting an individual asset is not. Meaning, if an asset crashed, a long put position would benefit from an explosion in volatility as well as, obviously, a decline in the underlying asset. This is one of the reasons why traders like buying puts, because the added component of volatility almost adds another way to make money. Ally Invest is the best broker to buy put options. Up to $3,500 cash bonus + commission free trades for new accounts.